I could make this review really short: buy both books. Stay home and read them. And then recommend them to all your friends and colleagues. Why? They will completely change the way you think about brains. They will change the way you think about healing problems. They challenge the very ideas we have about what treatment is and can be. As I mentioned on Monday, all of his books highlight the idea of neuroplasticity: ‘the property of the brain that enables it to change its own structure and functioning in response to activity and mental experience.’ Neuroplasticity is the game changer. The old conventional wisdom believed that our brains were hard-wired with a definitive amount of brain cells. And if anything happened to the brain, if there was any injury or disease—that was it—the thinking was that brain couldn’t make new brain cells and you had to work without the damaged areas. But the new science of neuroplasticity has shown this to be untrue. The brain, it turns out, is mostly Real Estate. It gets created as we use it and we can recruit other parts of our brain to work around problems if we need them to. In addition, the limited notion of the brain just being in your head is also the new science that the brain and the body have a two -way communication system. For example, there are neurons in your gut sending your brain information, and there are neurons in your brain sending your body information. We are a brain-body, not a brain with a body attached. It is an integrated system that we are just beginning to comprehend. But not only will his books change the way you think: it will change the way you approach change. It will challenge you to be more creative in your approaches to problems you are trying to solve either as the therapist or the client. And while his books are not ‘how-to’ books –they are ‘how will I think about and approach this now’ books. In his first book, The Brain that Changes Itself, one of the many neuroscientists that Doidge describes is the work of Taub, who discovered how the brain and body can heal from stroke. Typically with a stroke—there can be loss of capacity on one side of the body—you lose the capacity to use your right arm and leg, for example. And the conventional treatment was physical therapy of the affected body parts or capacity, like speech, but mostly you would get by with the limbs that worked. Taub turned it upside down. In his work with primates he found that if he constrained the limb that worked—by wrapping it to the body with an ace bandage or a cast so it couldn’t move at all, the limb that was affected and wasn’t working, actually began working again. And when this approach was tried on humans it had the same effect. If you put an oven mitt on the good hand, and had people do tasks with their affected hand, they regained their ability to use their hands. Even years after the stroke had happened. Doidge doesn’t directly discuss trauma, but I believe that if all of us read his books and tried to play with and apply his ideas, trauma treatment would move forward from where it is. I do psychotherapy, not physical therapy, so I played with what the psychological equivalents would be. How could you psychologically put an oven mitt on the part of the psyche that was working and get at the part that wasn’t? One young man I was working with at the time I read his first boo had had a severe brain injury when he was five. His family was here in the States. The family spoke a foreign language, which is really why they ended up with me because I could meet with the young man in his native language. He was struggling with decisions and transitions. He couldn’t tolerate change—of any sort. And he couldn’t decide, or converge on an answer because every option had benefits and so they were all good and he could get stuck for long periods of time in a loop. He was truly the most non-judgmental person I have ever met—and therefore the kindest person I ever met. But this inability to use judgment, meant he wouldn’t be able to keep himself safe. If you looked at his struggle through the lens of the stroke model, he had the capacity to be consistent and to be open-minded. Two things I was actually trying to teach a lot of other people. But he had no capacity to do the other. It wasn’t weak. It wasn’t there. So I worked with his mother to begin with small changes. To move one thing in his room, or in the garden every day. And when we met I would force him to choose something to talk about, or choose something he liked better than another. Or play games where he constantly had to choose where he was going to move and make him do it faster so that he couldn’t fall back on his ‘good muscle.’ He needed to use the muscle of distinction or convergence. Doidge’s books are available in multiple languages and his mother was able to read the book and begin to understand more fully how the brain works and how it can heal. And most of all—that there is incredible, I mean incredible, hope for healing when you see what can be done to heal brains. So many people had told her that her son wouldn’t heal further, and there was so much hope in the pages of his book to counter that view. This hope that is woven through both of his books is not just for the injured. In the corporate work I do, leaders and managers are often frustrated with their ability to make change in themselves or with the people they lead. They can feel hopeless that anyone can change at all. And yet when they learn about neuroplasticity---that we are building new neurons and capable of new learning right up until our last breath-they get energized. In his second book, The Brain’s Way of Healing: Remarkable Discoveries and Recoveries from the Frontiers of Neuroplasticity, he continues to report on different ways that brains can heal and the remarkable physicians and clinicians who pioneered new ways of approaching the problem and finding a solution. He covers treatments for blindness using movement, treatments for pain using visualization, treatments for dyslexia using music. Read his books for the specific stories and science because they are great. But even more, read them to expand your worldview of how our brain and body work and what we can do to support the healing process. Read them so we can all create a healthier future. As a psychologist and a psychologist-in-training I read a lot of books. 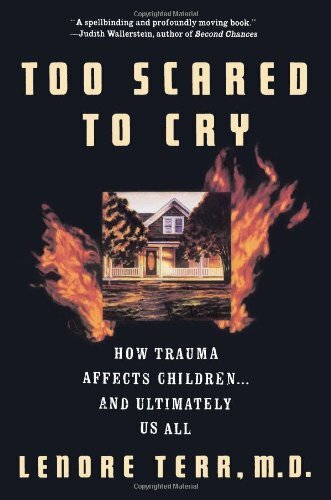 And I can say that despite many books being helpful, and informative or even downright formative of who I have become as a clinician and a person, there are very few books that helped me change the outcome of a person’s treatment so definitively as Too Scared to Cry by Lenore Terr. Too Scared to Cry is first a chronicle of Lenore Terr’s longitudinal study of the Chowchilla Bus kidnapping and other traumatic experiences lived by children. But it is foremost a completely thorough map of the terrain of the impact of trauma on children and their development and behavior. It is the best kind of research: it is thorough and detailed, and it is practical and understandable. That said, this is no ‘how to’ book. It is an ‘understand why’ book. It helps you see what was invisible and makes it visible. She covers the aftereffects of trauma—primarily single incident trauma- rage, denial, numbing and guilt. She covers how trauma affects memory, the experience of time, dreams and relationships. What it looks like in play and at ‘work.’ She dispels myths and creates a living picture of how children cope with the aftereffects using the resources they have. In my internship year I worked with a young girl who was hit by a car. She was walking in a crosswalk in front of a bus so she didn’t see the car on the other side of the bus. A year after this incident through a series of other events she was placed on a child inpatient unit. While she was on the unit she told her clinician there that she had the power to ‘see through objects.’ If you didn’t understand the effect of trauma, you would imagine that this was psychosis, and this is what happened on the unit. She was put on anti-psychotic medication. But she wasn’t psychotic, she was traumatized. And the wish to see through things, the wish to have the magical powers to keep the trauma from ever happening again is a common symptom. To be able to see through things, to know when bad things are going to happen. These are common, but not well known as symptoms of trauma. Because of Lenore Terr’s book, I was able to talk to the treatment team and have her taken off medication that was potentially harmful, and have the actual issue of trauma addressed. She uses stories and examples from her research and her clinical practice to explain the different phenomena and she does so without a lot of jargon —making it useful for both clinicians and for anyone involved with children. Since traumatized children, hopefully, grow up to be adults, it is an invaluable asset to understanding the impact of trauma for clinicians who work with adults or adults who lived through childhood trauma. And, while it focuses on the impact of trauma on children, much of what is in the book can be helpful in understanding adult trauma as well.